Yesterday, I had a wonderful Mother/Daughter dinner date with my mom that was followed with shopping. We went to one of our local favorites, Peyrassol-Cafe at Southport located by Gene Coulon Park in Renton, Washington. Bread service is always a must. 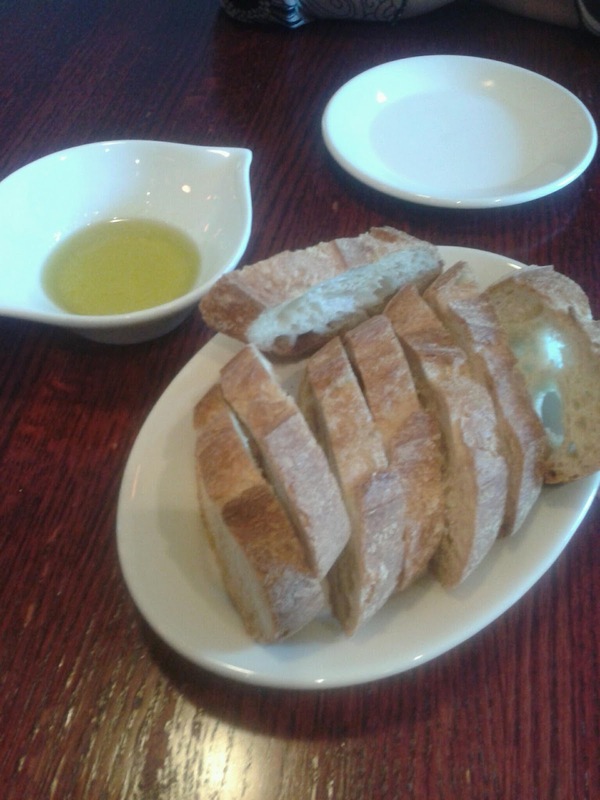 They serve a Grand Central Bakery bread that is delivered fresh and paired off nicely with an aromatic olive oil. 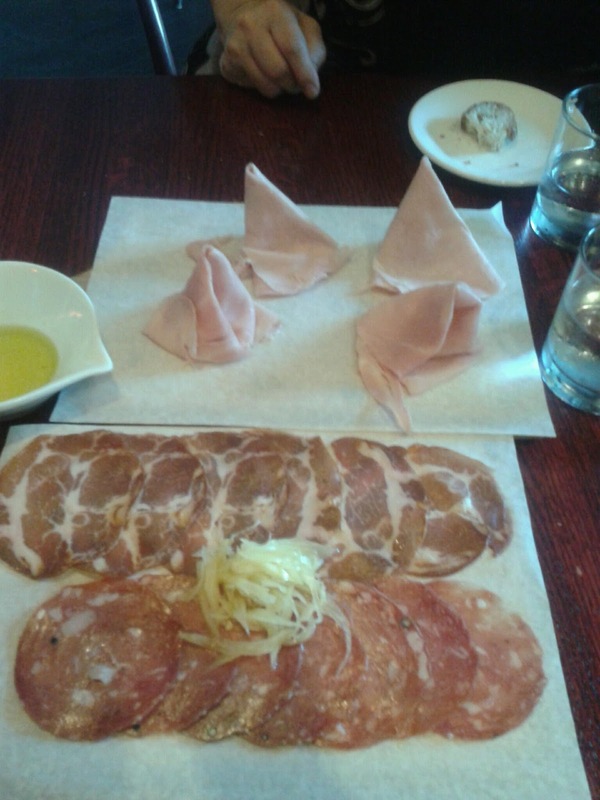 We had the charcuterie that came with nice ham, coppa (i think?) and salami with pickled fennel. The fennel matche perfectly with the drier cured meats and overall very appetizing. 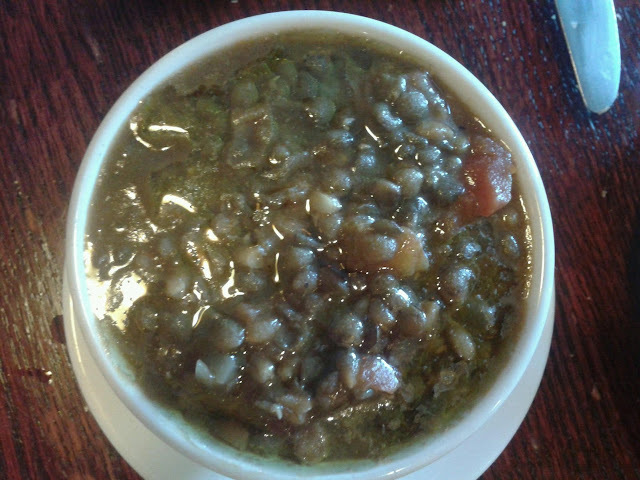 We also had a small cup of their soup of the day which was a lentil soup. For some reason, the chef made this extremely flavorful and I would love having this all the time compared to the plain lentil soup my mom makes >.< It had tomatoes and was topped with olive oil and filled with all sorts of spices. 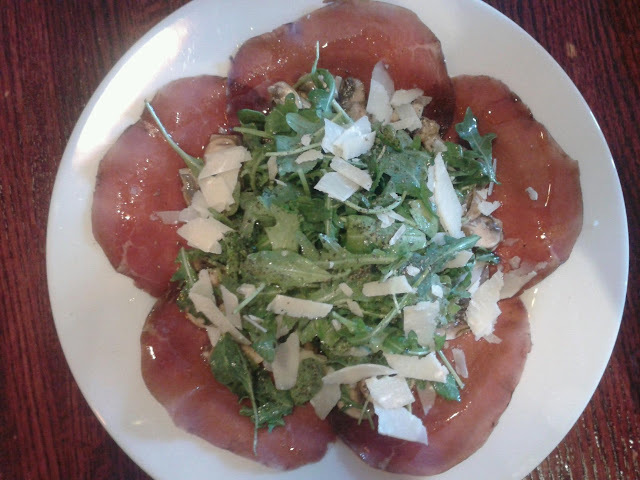 Then we had one of their special salads that had bresaola (I believe) topped with arugula, mushrooms, parmigiano reggianom, olive oil, salt and pepper. This dish was so simple but very well put together, along with the presentation. My mom had a little trouble with the cured meat since it was a little too chewy for her, but other than that, it was very enjoyable. Now for our main dishes. 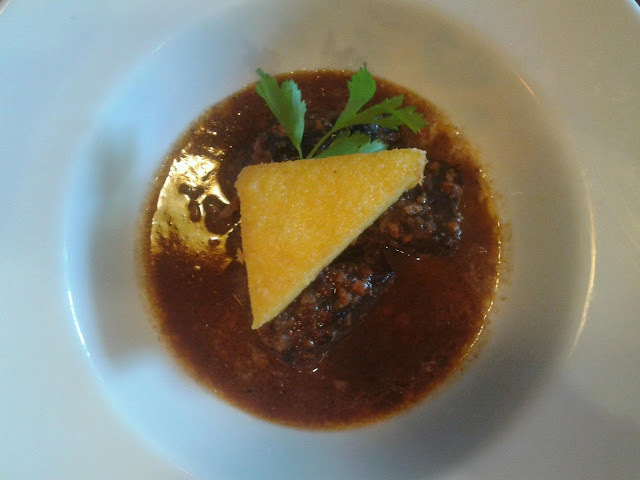 My mother ordered this Beouf Bourguignon- a slow roasted beef chuck with a polenta cake. Flavor wise, I feel like it could have been better and the beef could have been more tender. I do believe my mother could have made this dish better, at least flavor-wise, maybe adding a hint of star anise or some spice. It felt like a layer or 2 of flavor was missing. However, the polenta cake was excellent. Nice and crunchy on the outside, but nice and moist on the inside with a nice mild flavor. Then my dish came and I was definitely happy! I ordered their Papparadelle in a bolognese sauce and it was exactly the type of flavor I had imagined and craved! 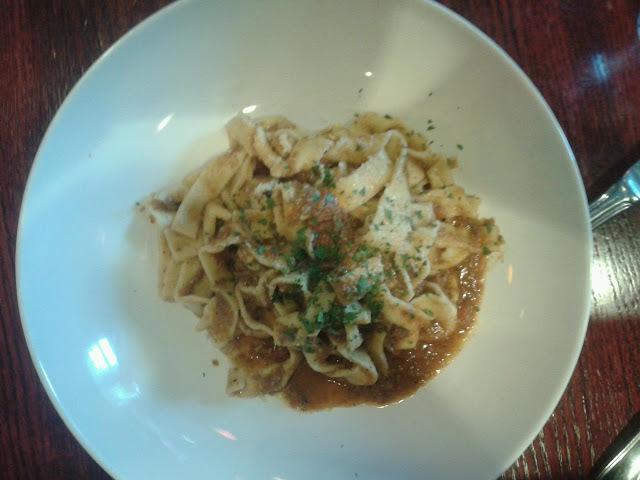 The wide cut noodle texture was nice an aldente. The sauce was amazing with the right amount of meats running through it along with just enough pepper spice and it wasn't too heavy with tomato. By far one of my favorite dishes I have had at this restaurant and I highly recommend it. If you're looking for a nice relaxing atmosphere or even one with romantic ambiance, then defnitely check this place out. It is in a nice little quite corner right by the lake with both indoor and outdoor seating which is perfect for the nice sunny days. It isn't too crowded in here and the service is excellent. It does take a little while for food to come out since it is basically all home made and made to order. The price is decent too for the quality you receive with some items right under $20. I think this place would be perfect to take for a special birthday or even a date. 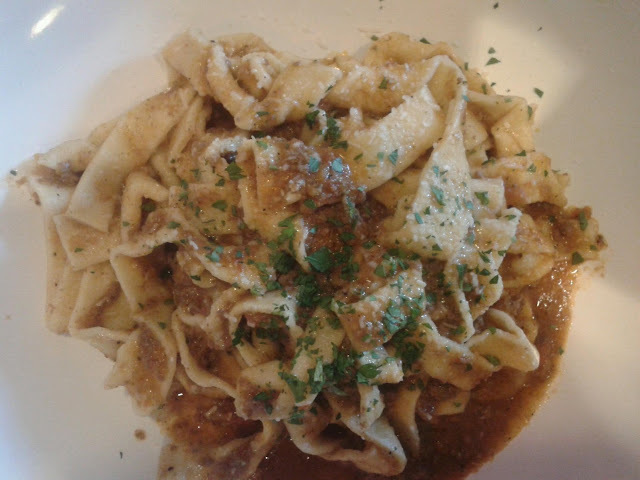 I have only been here for their dinner menu and will need to go back to check out their Brunch and Lunch offerings. everything looks yum, and pretty! don't miss out on my giveaway.. find me at..
thanks for the follow! and yes the food was absolutely delicious! it definitely was =P thanks!